In Iron Maiden’s long career there have been several double live albums, beginning with the 1985 classic Live After Death. But The Book Of Souls was the band’s first double album of original studio material – a grand and bold artistic statement delivered in an era when the album as an art form has been denigrated by streaming and downloading. It wasn’t always this way. 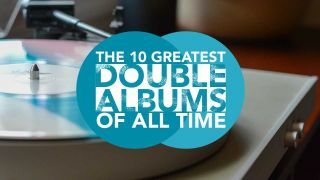 From the late 60s through to the late 80s, some of the greatest and most influential albums ever made were doubles, created by artists of every kind. There was progressive rock in The Lamb Lies Down On Broadway by Genesis and Tales From Topographic Oceans by Yes; soul and funk in Stevie Wonder’s Songs In The Key Of Life and two classic doubles by Prince, 1999 and Sign ‘O’ The Times; punk rock in London Calling by The Clash. Elvis Presley made a comeback in 1969 with a brilliant double album, The Memphis Record. And in 1992, a young rock band had the balls to make their debut a double – the Manic Street Preachers, with Generation Terrorists. There have even been, on rare occasions, triple albums, such as George Harrison’s All Things Must Pass and The Clash’s Sandinista!. But it’s the double album that we’re celebrating here. The rules are simple. No anthologies, no live albums, and no Red Hot Chili Peppers, despite the claims of Classic Rock’s Dave Everley that the Chilis’ Stadium Arcadium is a masterpiece. Not for nothing were they known as The ’Orrible ’Oo. They were one of the loudest bands on Earth, deafening and bludgeoning their audiences into submission. They were the quintessential lads’ band. And their drummer was a wildman that would make the antics of Ozzy Osbourne seem tame by comparison. And yet The Who’s two most famous records were high-minded art concepts: the double album rock operas Tommy and Quadrophenia. No world famous rock star has ever bared his soul to the extent that Roger Waters did with The Wall. Famously inspired by an incident at a Pink Floyd concert at Montreal’s Olympic Stadium in 1977 – when Waters was so pissed off by rowdy fans that he spat at one of them – The Wall was his meditation on the cultural, physical and spiritual divide between band and audience. Fuelling his sense of isolation was the pain of losing his father at a young age, and his long-held antagonism towards figures of authority. In the 70s, Springsteen had built his reputation on giving everything he had in his music – be it the overblown drama of his breakthrough album Born To Run, or the powerful intensity of its follow-up Darkness On The Edge Of Town. At the start of a new decade, he delivered an even bigger statement with The River. “Originally it was a single record,” Springsteen said. “I handed it in with just one record and I took it back because it I didn’t feel it was big enough.” This double album was a balancing act. Springsteen wanted to retain the character-driven songs of Darkness On The Edge Of Town, but also to add more of the kind of high-energy rock’n’roll that, in his words, “made our live shows so much fun”. With this album, Dylan completed a transition from folk to rock artist, a journey begun on his two albums from 1965, Bringing It All Back Home and Highway 61 Revisited. Save for one track, the whole of Blonde On Blonde was recorded in just seven days spread over two sessions in Nashville, with Dylan backed by a loose ensemble of high-class musicians including keyboard players Al Kooper and guitarist Robbie Robertson. Hendrix revolutionised rock music in 1967 with his debut album Are You Experienced?. Later that same year, he blew minds again with the cosmic Axis: Bold As Love. But it was on Electric Ladyland, released in ’68, that the greatest guitar player of all time rose to his artistic peak. The double album format allowed him room for extended, far-out improvisational jams such as the 15-minute Voodoo Child and the 13-minute trip 1983 (A Merman I Should Turn To Be). There is no other Stones album – arguably, no other rock’n’roll album – for which the story of its creation is so steeped in folklore and mystique. Although some tracks were recorded in London and Los Angeles, it was during sessions at Nellcote, a villa in the south of France, that the mythology of Exile On Main St. was born. Fittingly, the band’s most epic album includes their most epic track, Kashmir, and other huge pieces such as In My Time Of Dying and In The Light. And from the vaults, Page pulled out a number of brilliant tracks that hadn’t made the cut on previous records: outtakes from Led Zeppelin IV in Night Flight and Boogie With Stu, the latter named after guest star and “sixth Rolling Stone” Ian Stewart; and from the Houses Of The Holy sessions, that album’s ‘lost’ title track and the rustic Black Country Woman, recorded al fresco with the sound of a plane flying overhead.